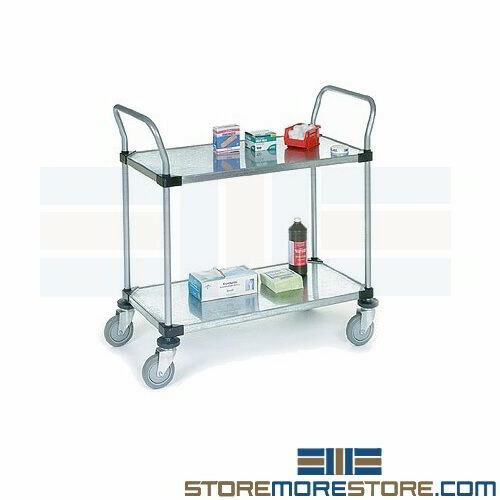 Mobile service stainless carts are a long-lasting and efficient storage and transport solution for all types of hygienic and sanitary applications in healthcare, food service, and more. Adjustable solid shelves are ideal for use as a strong surface for bulky items. 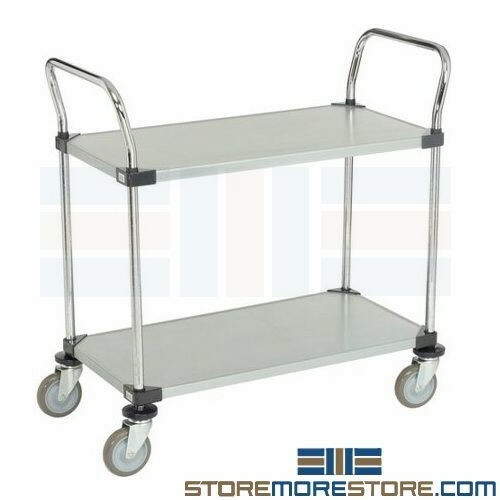 Solid shelf carts provide sturdy storage and efficient transportation of bulky items, inventory, and supplies. The galvanized or stainless steel finish allows easy cleaning and maintenance for sanitary applications in healthcare and food service. Four swivel casters and a chrome handle makes navigating the cart fast and easy. Construction: Galvanized or type 304 stainless steel construction as indicated on model. Shelves: Shelves adjustable on 1" increments (comes with 2 or 3 shelves as indicated on model). Wire, solid, and plastic shelves can be used on the same unit. Warranty: Lifetime manufacturer's limited warranty on stainless steel and galvanized finishes.